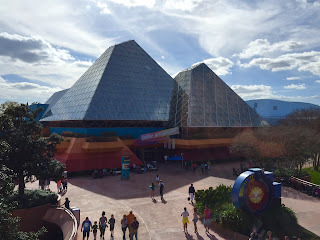 Here is another attraction photo taken from the Epcot monorail last week. The Journey Into Imagination pavilion has such a distinctive look, with the glass pyramids. If you look in the right edge of the picture, you can see the building that houses Soarin. Although this attraction is technically part of The Land pavilion, it is very close to Imagination.